There will be quite a few upset coaches when the Wod train finally gets the hell out of Evansville. How’d the game go today Silky? I couldn’t be there - can you post a score? In other news, the Lady Panthers went into Evansville without their 2nd leading scorer and absolutely blitzed the Eagles. Forced a program record 45 turnovers. USI had more turnovers than field goal attempts. Molly’s team will almost assuredly be ranked #1 in the nation in the next poll. Probably cemented Stein’s 3rd consecutive GLVC Coach of the Year award. Ha ha that’s funny right there! Now the real question is how many points Davenport wants to beat us by. Does he play the reserves a lot and win by 20 or a little more or does he just put the pedal to the floor and win by 35? Please win by 35+ so we can add that to Wod’s stellar resume! I have a feeling Scotty shares in the same belief with us knowledgeable USI fans....Wod is a clown. I expect him to beat Wod into the fetal position. The team I keep looking at and thinking is flying under the radar a bit is Indianapolis, at least in terms of where they stack up in the region. They have five losses on the year, yes, but only two of those count as regional losses. Twice to Lewis, oddly enough. Must just be a bad/weird matchup. Their other three losses: two came to teams that will probably be ranked in the Central region (Washburn, Pittsburg State) at a neutral site, and Olivet Nazarene, which doesn't count as a D2 loss at all. They still have a lot of tough games left, including USI and BU twice, UMSL, and a trip to Truman. They start all of that with the sometimes-tricky Illinois trip this weekend through McKendree and Illinois Springfield. UIS desperately needs a win on its home court with the schedule it has left. Indy has underperformed, but looking at their starting five, they are the only team in the conference that comes close to matching up with Bellarmine. King, Hardaway, Kempson, and Lakes are potential all conference players. Their biggest weakness is a lack of depth in the front court. The 29 point blow out loss at home to Lewis is a complete head scratcher. Bellarmine's game at Indy will be the toughest game the Knights have left to play. As far as under the radar, take a look at UMSL. They are in good position to finish second in the league. Their remaining schedule is not easy, but it appears to be more manageable than some of the other contenders' schedules. 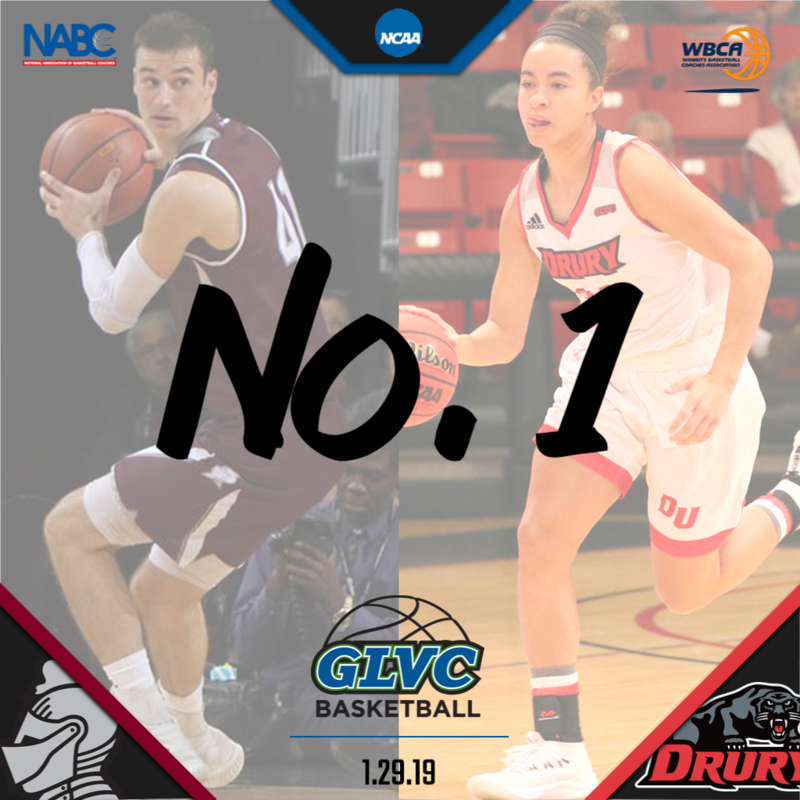 Yesterday – for the first time since 2015 – a #GLVCmbb and #GLVCwbb team were voted the top team in the nation at the same time! I honestly think he wants to throttle us every single time he plays us because of Watson. Even with the great KWC teams of the 90's and 00's Pearl/Herdes never had a 1-9 stretch against KWC. Scotty flat out OWNS Wod. I have a feeling it will be a 25-30 point blowout! Indy has the talent to beat almost anyone in our league. They will out-athlete USI at almost every position...not to mention Gouard is actually passionate about his team and basketball in general, whereas Wod sits like an overweight bump on a log in a suit that doesn't fit. I'm not convinced you are right with regards to UIndy vs USI. Recall last season, we beat them in both meetings. We won by 6 at Indy and by 22 at USI. I'd argue that our team this season is better than last, but I don't know much about Indy's team this year. Did they improve? They did beat Drury (barely) and Rockhurst (barely), but no real standout wins, just like USI. If I were coaching another team UINDY would worry me more than USI. Heck, you play a zone against USI you can **** them down in their tracks...period. I know that Stan is a legend in USI basketball, but he has not impressed me as a coach anymore than Watson. UINDY concerns me because they clearly have more talent than the other teams not named Bellarmine in the league. Bellarmine is going to be their biggest game of the year and when you get talent to focus, they can be dangerous. I too have reservations about Stan. He would not be high on my list of potential coaches to replace watson. Good recruiter but horrendous at the Xs and Os. One of the few coaches in the league Wod can match wits with. I agree that I wouldn’t want him as the next coach either...but he’s won 5 times more tournament games than Watson...and actually has some enthusiasm towards his program. It’s not the same ho-hum, I’m just riding out until my retirement attitude that Watson has. A few good games this Saturday. For the men, Southern Indiana/Bellarmine, Truman/Drury and Indianapolis/Illinois Springfield are the ones to watch IMO. Drury seems to be steadily improving, and it's been well-documented on here that their record should be much better if they had even just had bad luck (up from: rotten luck) in all the close games they have played. For the women, Truman/Drury is probably the headliner, but I don't know if anyone in the league is even close to Drury's level. A huge gap sorting itself out on the women's side with Drury, Truman, Lewis, Southern Indiana and Maryville pulling away and about the lap the field. Those first four have to be near locks to make the NCAA tourney at this point, and Maryville is probably right in there with Mich Tech and Ferris State for the final spot. Assuming that Ashland, Grand Valley and Cedarville are the other three. wonder what the point spread is for the BU/USI game is. I envision BU winning by 23. I would set the line at Bellarmine -18.